The PaceMaster Gold Elite Fold-up treadmill is the foldable version of the highly successful Pacemaster Gold Elite. And just like its non-folding counterpart, this one also provides excellent value for your money. This treadmill is perfect for people looking for a quality machine but needs to store it after use due to lack of space at home. It offers the convenience of a foldable treadmill without sacrificing quality, size, power and feature. This is definitely one of the best folding treadmills in the market today. The 3.0 HP continuous duty McMillan motor is the same powerful motor which is also being offered by its non-folding counterpart. This motor has a speed range of 0.5 to 12 mph and an incline range of 0% to 15%, adjustable in 0.5% increments. Thus, allowing for more intense workouts. Pacemaster uses a 2 ply stretch resistant Texglide tread belt for this machine. This belt is rated for up to 10,000 miles. This simply means that you will be getting a problem-free belt that would last for a very long time. The 20" x 60" running space is wide and long to make you comfortable during workouts. This long tread belt is perfect for tall people who usually require bigger strides. The Tri-Flex Impact Shock Management System gives PaceMaster Gold Elite fold-up users maximum shock absorption. This cushions impact on your ankles, knees, hips and back for added protection and utmost comfort. The Gold Elite Fold-up treadmill also comes with tons workout programs. It has 3 custom programs, 5 heart rate programs, and 7 workout programs with 9 levels of intensity. All these are offered to you for more variety and flexibility. It also has 4 user ID’s and fitness evaluation so you can have a more personalized workout. The express speed key and express incline key is perfect for those looking to do interval training. These keys enable you to easily change the speed or incline of your workout with a push of a button. Just like most Pacemaster treadmills, this one also comes with a lifetime warranty for its frame, 12 years for the drive motor, 5 years for parts and a year for labor. This simply proves that the manufacturer is behind their product. According to my research, the main complaint for this machine is that when you incline the machine the handle bars doesn’t elevate with the platform. As a result, users have a hard time trying to hold onto the handle bars. 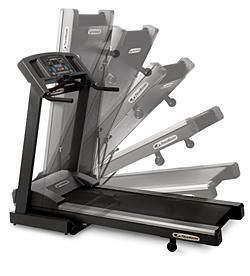 Although this is a common problem with most folding treadmills, I still think that Pacemaster should have done something about it considering that they are selling this unit for almost $2,500. I’m currently having a hard time locating an internet retailer carrying the PaceMaster Gold Elite Fold-up treadmill, so for now, I suggest you locate a dealer near you through PaceMaster. It is being sold for just $2,499.